Strengthen the Power Africa Initiative through a multiyear congressional authorization with clear authorities. Reform the Overseas Private Investment Corporation (OPIC) or establish a modernized US Development Finance Corporation to catalyze and harness private capital for energy development (see related proposal — Bringing US Development Finance into the 21st Century). Ease restrictions on countries that are most energy poor but least responsible for global emissions. Upgrade to a realistic definition of modern energy access. Energy poverty is endemic in most developing countries, especially in Sub-Saharan Africa. The International Energy Agency (IEA) estimates that nearly 1.3 billion people globally lack access to electricity, and about half of these people live in Africa. 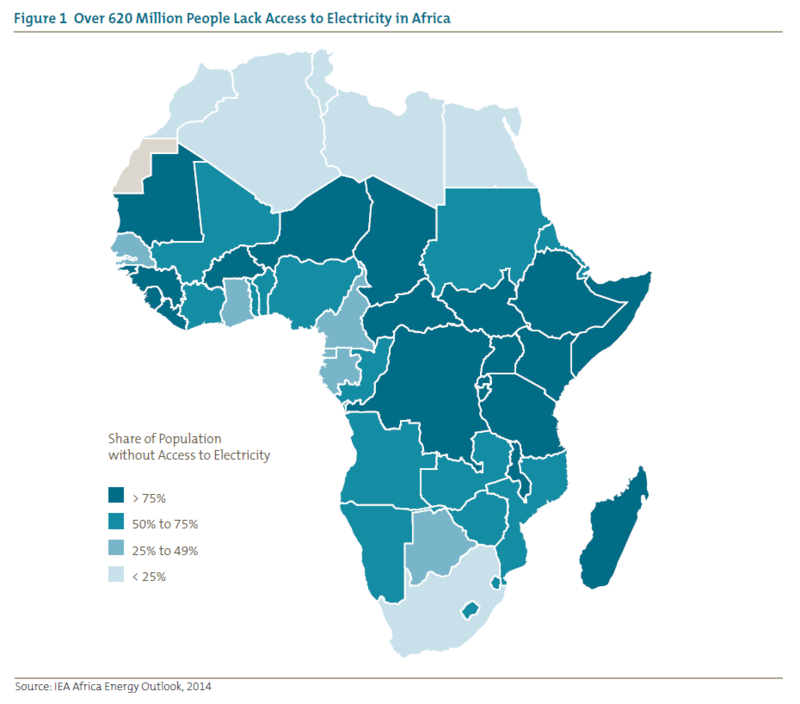 Sub-Saharan Africa is particularly energy poor: only 32 percent of the total population has “modern energy access,” according to even the most minimal definition. While rates vary between and within countries, in at least 37 Sub-Saharan countries, less than half the population has electricity. In extremely poor and post-conflict countries — such as Liberia, South Sudan, and Sierra Leone — rates are less than 5 percent. 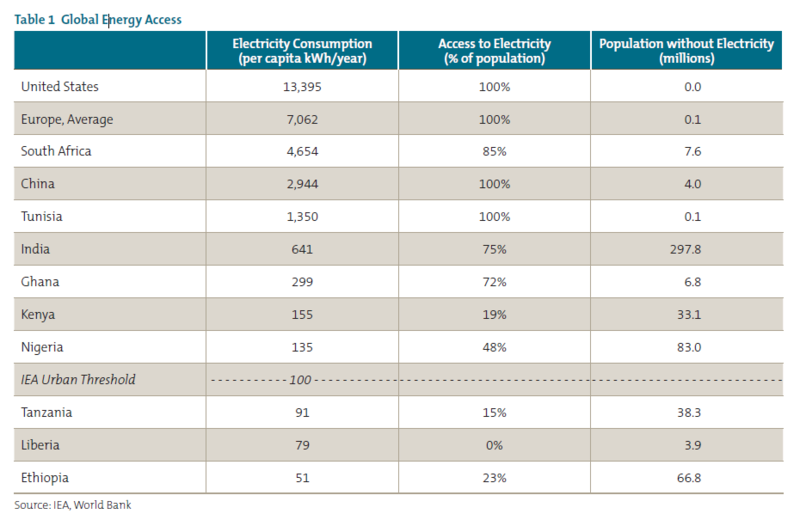 In these countries, electricity is a luxury available for only a handful of elites (see figure 1). While these statistics tell a disheartening story, the reality on the ground is even worse. For those technically with “access”—that is, those whose homes or businesses are hooked up to a power grid — the actual flow of electricity is both sporadic and costly. Brownouts and electricity rationing are the norm, with even South Africa experiencing rolling scheduled blackouts in 2014. In Nigeria, a 2014 poll indicated that nearly two-thirds of citizens with an electrical connection received fewer than five hours of continuous power supply on a daily basis. Countries simply do not generate enough electricity to meet growing demand with outdated and insufficient infrastructure. Excluding South Africa, installed generation capacity in Sub-Saharan Africa is only 45 gigawatts (GW). This is equivalent to the installed capacity in the state of Illinois. Nigeria (population 174 million) has 23 power plants connected to the national grid with a generating capacity of roughly six 6 GW, which is roughly the same as North Dakota (population 723,000). 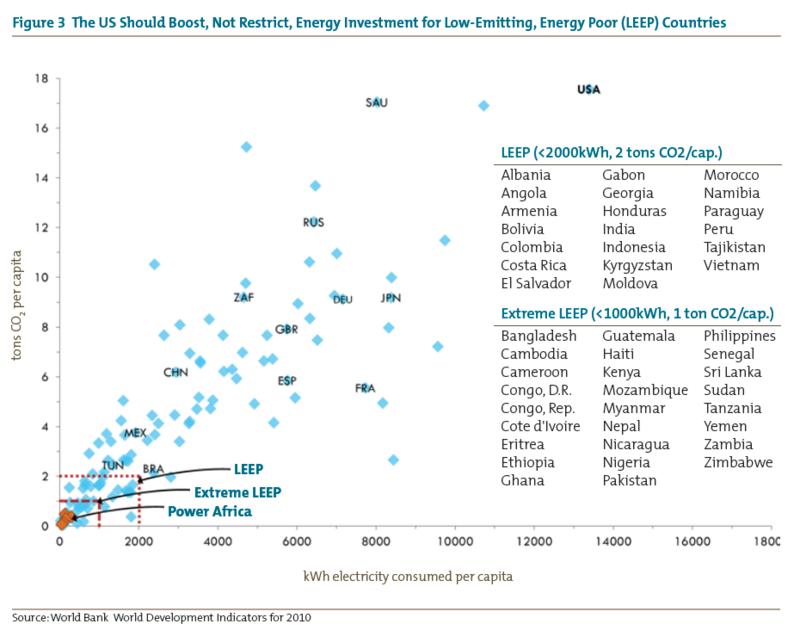 Liberia has zero large-scale power plants. Unsurprisingly, a recent detailed analysis of the Liberian economy highlighted electricity (as well as roads) as the top binding constraint on growth. Not only is power in short supply, but it is also extremely costly. According to the World Bank, power prices are up to three times more expensive in Sub-Saharan Africa than in most developing countries ($0.13 per kilowatt hour [kWh] versus $0.04–$0.08/kWh). Liberia has the world’s highest power prices at $0.57/kWh, while the cost of generating power is $0.77/kWh. With 84 percent of Liberians (and 47 percent of Sub-Saharan Africans overall) living on less than $1.25 per day, affordable electricity is simply out of reach for most people. High costs and low supply contribute to extremely low electricity consumption, even for people with “access.” By illustration, the average American uses about 13,200 kWh per year, or nearly 100 times that of the average Nigerian. 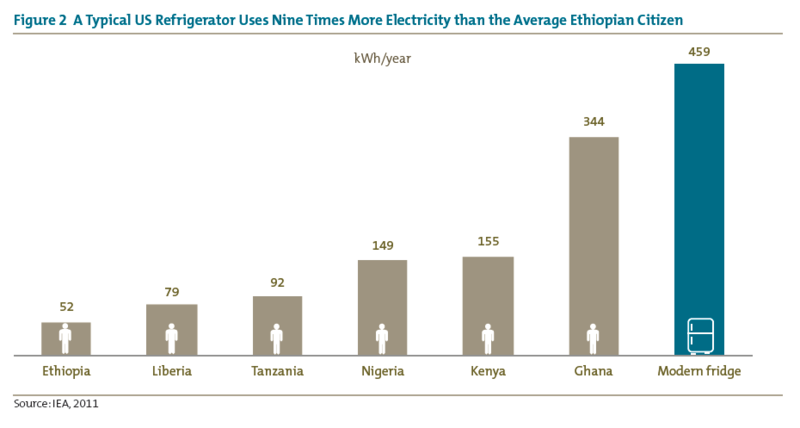 Most African citizens consume less power per year than what a typical modern refrigerator uses (see figure 2). Energy poverty has far-reaching and deadly consequences. The lack of electricity and clean fuels means there is little or no access to electric cooking and heating, which are safer and healthier. Indoor air pollution caused by burning biomass fuels (such as wood and charcoal) causes an estimated 3.5 million premature deaths globally a year, more than AIDS and malaria combined. Moreover, some 60 percent of refrigerators used in health clinics have unreliable electricity, compromising the effectiveness of vaccines and pharmaceuticals to fight preventable diseases. Living without power also harms education, preventing students from studying at night and limiting technologies that schools can use for teaching. Energy shortages are a massive drag on economic growth and job creation. While recent growth rates of African economies have been impressive, World Bank enterprise surveys have consistently pointed to the lack of reliable, affordable electricity as a top constraint to business expansion. For instance, 76 percent of firms in Nigeria cite electricity as the biggest constraint to their operations. This is not surprising because they lose 9 percent of annual sales to electricity outages, which occur 302 days a year. And with 12 million African young adults entering the job market each year facing staggering unemployment and demanding better economic opportunities, these constraints have implications for US national security and commercial interests. The IEA calls energy poverty a “brake” on development and growth, one that must be released to build modern economies and raise living standards. However, energy access in Africa is not a global climate issue. Across the Power Africa countries, average per capita CO2 emissions are a mere 0.3 tons per year — almost 20 times less than the global average, and 60 times less than the United States (see figure 3). Africa is responsible for only 2.5 percent of global cumulative emissions since 1980, despite being home to nearly 15 percent of the world’s population. African countries are going to require a range of technologies and fuels to close the energy gap, but with such a low starting benchmark, even better-than-expected increases in African energy consumption would have a negligible impact on the broader climate challenge. At the same time, increased energy access would have a hugely beneficial impact on African development and growth. Now is a critical moment to alleviate energy poverty. Global leaders have increasingly called for a more intensive focus to close the growing energy access gap. The post-2015 Sustainable Development Goals (the guiding global development agenda intended to succeed the Millennium Development Goals) are likely to include an energy goal, with initial drafts aiming to “ensure access to affordable, reliable, sustainable, and modern energy for all.” The World Bank and United Nations have launched their Sustainable Energy for All initiative, which aims to bring universal access by 2030. And at the African Development Bank, the regional bank most engaged on the front lines of energy poverty, power projects are the second highest sector in the portfolio. The increasingly dire situation of African energy poverty comes at the same time as burgeoning private-sector interest and opportunity in the region. Emerging and frontier markets are demonstrating growing demand for energy, and private investors are beginning to respond. In 2013, more than one-fifth of foreign direct investment inflows to Africa were for energy-sector projects, and new investment partnerships between some of America’s largest private-equity firms and major African infrastructure companies signal a deliberate pivot toward the continent. This shift creates an opportunity for the US government to leverage business engagement and help build the next generation of emerging markets, with only a modest budgetary impact. The current global economic and political agendas are more aligned than ever to fight energy poverty. The intersection of multilateral agency, bilateral government, and citizen and business attention offers unique traction for strategic partnerships for the United States — with potential economic, political, and diplomatic dividends. The United States should build on the momentum from Power Africa. The US government has already emerged as a leader on the energy poverty agenda through the Power Africa initiative. Launched by President Barack Obama in June 2013 and expanded in 2014, the effort aims to boost generation by 30 GW and provide access to 60 million homes or businesses through a mix of public- and private-sector tools. These highly ambitious goals translate into covering roughly 300 million Africans, or roughly half of those currently living without electricity. Initial public resource commitments total $7.3 billion (principally from the US Export-Import Bank and the Overseas Private Investment Corporation [OPIC], plus some US Agency for International Development technical assistance), as well as $20 billion in private capital from power development companies and investors. The initiative has also leveraged additional interest and investment from other multilateral and bilateral actors, such as $5 billion from the World Bank and $1 billion from Sweden. Further US government leadership in pushing the energy poverty agenda forward will likely bring even more partners into the mix. Power Africa provides a useful framework to accelerate US policy for energy access over the next decade. As home to some of the world’s largest energy-sector firms and largest pools of private capital, the United States has a particular advantage in encouraging private-sector involvement. The US government already has agencies, such as OPIC, that can help link these firms to commercially viable energy projects. Likewise, the United States has a unique capacity for sharing energy technology expertise, stemming both from private-sector experience and from public research and development labs. Power Africa also has significant potential to establish modernized engagement models between the United States and developing countries; these models are based on partnership and mutual interests rather than on the increasingly outdated donor-recipient model. While Power Africa is promising, its future is far from guaranteed because constraints hold the United States from achieving its potential. Misguided investment regulations are a constraint. In response to interest group concerns about global carbon dioxide emissions, the US Congress has hamstrung US development finance tools. Yet, these restrictions have little impact on global climate change objectives, while causing significant harm to poor people in developing countries. For instance, a carbon emissions cap on OPIC’s portfolio has effectively pushed it out of nearly all natural gas power projects in the world’s poorest countries. Meanwhile, these same countries are developing their own natural gas resources, which can fuel affordable electricity at home. This strategy is not only preventing US investment in potential power plants, but it is also ineffective as a carbon mitigation response. The poorest countries produce almost no carbon emissions; all of Sub-Saharan Africa accounts for only about 2 percent of current global emissions. In other words, even if all African countries adopted zero-carbon strategies, it would make virtually no difference to global targets. Yet, blocking finance for natural gas projects in poor countries will cause certain harm by denying electricity to millions of people. Moreover, the current approach is blatantly inconsistent with the long-established “all of the above” domestic energy strategy. The existing definition of modern energy access is far too low. The commonly used IEA standard is a consumption level of 250 kWh per year (or roughly 50 kWh/person/year) in rural areas and 500 kWh per year (100 kWh/person/year) in urban areas. By comparison, an average of 100 kWh/year is the equivalent of powering a single 60-watt lightbulb for five hours per day. This is closer to a definition of energy poverty than anything remotely close to a dignified, modern standard of living. We propose four additional steps that would build on recent progress and overcome remaining barriers to powering up US policy in the fight against energy poverty. The next US president, in close partnership with the US Congress, should pursue four concrete actions that would both solidify and improve the impact of existing efforts to address African energy poverty. 1 Strengthen and formalize Power Africa through authorizing legislation and clearer authorities. The greatest risk with Power Africa is that, like other presidential initiatives, it will fade away after the founding administration leaves office. Energy poverty is too long term and too critical an issue to allow that to happen. Legislation like the Electrify Africa Act, which the House of Representatives passed in May 2014 on a bipartisan basis, and the Energize Africa Act, now being considered in the Senate, would keep Power Africa and its programs going beyond 2016. More important, it would provide a clear bipartisan signal of political support to ensure that the effort continues. Previous development legacies — such as President Clinton’s African Growth and Opportunity Act, President Bush’s PEPFAR (President’s Emergency Plan for AIDS Relief), and the Millennium Challenge Corporation — have enjoyed support from Congress. As a result, each of these legacy initiatives is still with us today. Successfully passing authorization legislation for Power Africa will make it a durable US development effort and ensure that energy poverty remains at the top of the US-Africa agenda. This legislation could improve the Power Africa initiative by establishing (1) clear executive branch authorities and responsibilities beyond ad hoc interagency arrangements that are heavily reliant on White House staff; (2) transparent performance metrics for tracking progress and holding US agencies accountable; and, (3) country-eligibility benchmarks for guiding the expansion of Power Africa beyond the original six focus countries (Ethiopia, Ghana, Kenya, Liberia, Nigeria, and Tanzania). 2 Reform OPIC or create a wholly modern US Development Finance Corporation. 3 Ensure that environmental regulations do not deny energy access for low-emitting poor countries. For practical and ethical reasons, the United States should align its domestic and global energy policies by easing restrictions on those countries that need energy the most and are least responsible for the global emissions. The fiscal year 2014 Consolidated Appropriations Bill temporarily lifted the OPIC carbon cap using World Bank eligibility, which is based principally on average national income. An alternative long-term solution would be to link regulatory constraints to actual emissions and energy needs. In this manner, OPIC would be able to support natural gas projects in low-emitting and energy poor countries, while the carbon cap would remain in place for all other developing countries. 4 Establish a meaningful definition of modern energy access. The United States should encourage the IEA, the United Nations, or the World Bank to establish a more reasonable and dignified energy access target. This could take several forms. They could simply use a higher per capita threshold (e.g., Tunisia’s 1,300 kWh or South Africa’s 4,600 kWh). They could adopt a multi-tier index of access, such as the Global Tracking Framework the World Bank is developing. Alternatively, these global bodies could base the benchmark level on a more reasonable estimate of daily energy requirements, which would reflect a basket of basic services needed for modern life. The purpose would be to affirm that access to affordable, safe, and clean energy is a worthwhile goal and potentially a post-2015 global development goal. Mark Caine, Jason Lloyd, Max Luke, et al. Our High Energy Planet (Tempe, AZ: Consortium for Science, Policy, and Outcomes [Arizona State University], 2014). International Energy Agency. Africa Energy Outlook: A Focus on Energy Prospects in Sub-Saharan Africa. (Paris: International Energy Agency, 2014). Todd Moss and Benjamin Leo. “Let There Be Light: Washington’s Ambitious Plan to Help Africa Generate Electricity.” Foreign Affairs, September 2, 2014. Todd Moss, Roger M. Pielke, Jr., and Morgan Bazilian, “Balancing Energy Access and Environmental Goals in Development Finance: The Case of the OPIC Carbon Cap.” CGD Policy Paper 38, Center for Global Development, Washington, 2014. NOI Polls, “6 in 10 Nigerian Households Received Less Than 5 Hours of Power Supply Daily in Q1,” www.noi-polls.com/root/index.php?pid=237&ptid=1&parentid=13. International Energy Agency, Africa Energy Outlook: A Focus on Energy Prospects in Sub-Saharan Africa (Paris: IEA, 2014), 40. US Energy Information Agency, “Net Summer Capacity of Utility Scale Units by Technology and by State, 2012 and 2011 (Megawatts),” www.eia.gov/electricity/annual/html/epa_04_07_a.html. National Integrated Power Project (NIPP), “Nigerian Electricity Market,” www.nipptransactions.com/background/electricity-market/. Millennium Challenge Corporation and Government of Liberia, Liberia Constraints Analysis (2013), https://assets.mcc.gov/press/­LIBERIA_CONSTRAINTS_ANALYSIS_FINAL_­VERSION.PDF. World Bank, “Fact Sheet: The World Bank and Energy in Africa” (Washington, DC: World Bank Group, 2013). S. S. Lim et al., “A Comparative Risk Assessment of Burden of Disease and Injury Attributable to 67 Risk Factors and Risk Factor Clusters in 21 Regions, 1990–2010: A Systematic Analysis for the Global Burden of Disease Study,” TheLancet, 380: 2224–60. GAVI Alliance, “National Ownership of Innovative Supply Chain Technologies,” session summary, GAVI Alliance Partners’ Forum, Dar es Salaam, December 5–7, 2012, www.gavialliance.org/library/pf2012-sessions/11-%E2%80%93-national-ownership-of-innovative-supply-chain-technologies/. V. Ramachandran, A. Gelb and M. K. Shah, Africa’s Private Sector: What’s Wrong with the Business Environment and What to Do About It (Washington: Center for Global Development, 2009). World Bank, “Enterprise Surveys: Infrastructure,” www.enterprisesurveys.org/data/­exploretopics/infrastructure#sub-saharan-africa. African Economic Outlook, “Employment Outlook for Youth,” www.africaneconomicoutlook.org/­theme/youth_employment/­employment-outlook-for-youth/. IEA, “Africa Energy Outlook,” 15. J. G. Canadell, M. R. Raupach, and R.A. Houghton, “Anthropogenic CO2 Emissions in Africa,” Biogeosciences 6: 463–468. UN Open Working Group on Sustainable Development Goals, “Outcome Document,” http://sustainabledevelopment.un.org/focussdgs.html. African Development Bank, Annual Report (Tunis: African Development Bank Group, 2013), xi. Benjamin Leo, “Is Anyone Listening? Does US Foreign Assistance Target People’s Top Priorities?” (CGD Working Paper, Center for Global Development, Washington, 2013). CIA World Factbook, “Natural Gas-Proved Reserves,” 2013. https://www.cia.gov/library/publications/the-world-factbook/rankorder/2253rank.html. United Republic of Tanzania, “The National Natural Gas Policy of Tanzania — 2013,” Section 3.1.2. www.tanzania.go.tz/­egov_uploads/documents/­Natural_Gas_Policy_-_Approved_sw.pdf. Standard Bank Group, “Africa Remains a Bright Spot on Global Investment Landscape,” blog post June 24, 2014, www.blog.standardbank.com/node/60442. Devin Banerjee, “Blackstone, Carlyle Join Africa’s Dangote for Investment,” Bloomberg News, August 5, 2014, www.bloomberg.com/news/2014-08-05/blackstone-carlyle-join-africa-s-dangote-for-investment.html. White House, “Fact Sheet: Powering Africa: Increasing Access to Power in Sub-Saharan Africa,” www.whitehouse.gov/the-press-office/2014/08/05/fact-sheet-powering-africa-increasing-access-power-sub-saharan-africa. Todd Moss, Roger M. Pielke, Jr., and Morgan Bazilian, “Balancing Energy Access and Environmental Goals in Development Finance: The Case of the OPIC Carbon Cap” (CGD Policy Paper 38, Center for Global Development, Washington 2014). Even some renewable sources are constrained by US mandates. For example, a provision in the 2015 Omnibus restricts the US Treasury’s approval of large hydroelectric projects at the multilateral development banks, specifying an extensive list of criteria and consultations they must satisfy before voting, due to concerns about other environmental effects. Morgan Bazilian and Roger Pielke, “Making Energy Access Meaningful,” Issues in Science and Technology (Summer 2013): 74–79. Benjamin Leo, Todd Moss, and Beth Schwanke, “OPIC Unleashed: Strengthening US Tools to Promote Private-Sector Development Overseas” (Center for Global Development, Washington, 2013). See also Leo & Moss USDB proposal (2015) for additional details and options. Benjamin Leo and Todd Moss, “Bringing US Development Finance into the 21st Century: Proposal for a Self-Sustaining, Full-Service USDFC” (Center for Global Development, Washington, 2015). International Energy Agency (IEA) and the World Bank, Sustainable Energy for All 2013–2014: Global Tracking Framework Report (Washington: World Bank, 2014).